The ubiquitous particles are helping to map the innards of pyramids and volcanoes, and spot missing nuclear waste. The muon is going mainstream. The particle, a heavy version of the electron that rains down on every square centimetre of Earth, is little known outside particle physics — and last year it helped archaeologists to make a stunning discovery of a previously unknown chamber in Egypt’s Great Pyramid1. Physicists have been experimenting with the technique since the 1950s, including an unsuccessful search for hidden chambers in the second-largest pyramid at Giza2. 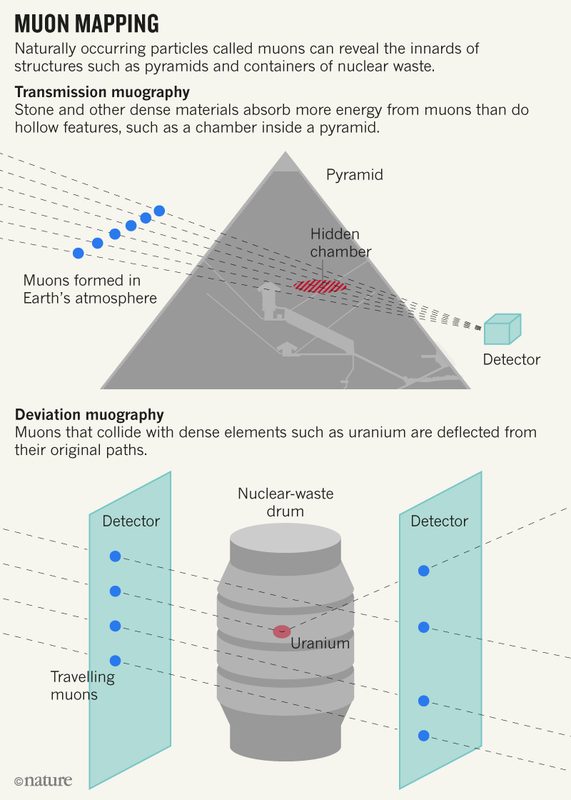 But the room-sized detectors were expensive and impractical, says Raffaello D’Alessandro, a particle physicist at the University of Florence, Italy, and a co-organizer of the muography meeting. They could weigh more than 10 tonnes and relied on muons’ ability to ionize particles of sometimes explosive gases. Ways to track the paths of charged particles more precisely — developed at facilities such as CERN, Europe’s particle-physics laboratory near Geneva, Switzerland — have made for safer, smaller and more-sensitive muon detectors. They can now be as compact as a few square metres and can run on solar panels, making it possible to take them to remote field sites. Smaller devices are also being used in archaeology, says Giulio Saracino, a physicist at the University of Naples Federico II in Italy. He and his team have mapped cavities and tunnels under Mount Echia, a settlement in Naples that has been occupied since the eighth century bc. They also plan to look for a rumoured aqueduct beneath the nearby ancient city of Cumae. And D’Alessandro is part of a team using muons to probe inside the walls of the dome of Florence’s fifteenth-century cathedral, which has developed cracks. A spate of commercial applications for muography — five were presented at the conference — probe smaller samples, such as drums of nuclear waste. These applications often use a slightly different technique, which tracks how muons change direction when they hit atomic nuclei in a material. By placing detectors on both sides of a sample, physicists can recreate a particle’s trajectory. And because the angle of deflection correlates with density of the substance the muon hits, studying these paths can help to create a density map of the material being probed. Engineers can use this method to spot stray fragments of uranium inside containers of nuclear waste, even if it is encapsulated in concrete or steel. “To get information about what is deep in the centre, muons are pretty much the only thing that can do that,” says Mahon. Heis director of a firm called Lynkeos Technology based in Glasgow, which will start imaging nuclear-waste samples next month at the UK National Nuclear Laboratory at Sellafield. It will be the company’s first commercial contract. Clarification 25 May 2018: This article has been amended to make clear that the dome of Florence’s cathedral is not at immediate risk of collapse. Morishima, K. et al. Nature 552, 386–390 (2017). Alvarez, L. W. et al. Science 167, 832-839 (1970).